What is Babywearing for Birth Professionals? This offering is a six-hour/one-day course about baby carriers, their technical use, and practical as well as health-based applications. Who should take Babywearing for Birth Professionals? Anyone who works with caregivers of infants can benefit from this new workshop. Birth and Postpartum Doulas, Midwives, Chiropractors, Lactation Consultants and Educators, Pediatricians, Retail owners and employees, Day Care providers, and more! Professionals who interact with babies on a regular basis and find a carrier useful as a parenting tool, public health intervention, and skill for breastfeeding and attachment support will find this workshop particularly useful. There's a lot to know about babywearing! The styles of carriers available today are ever expanding - from waistless buckle carriers to carriers that grow with your baby, there's so much to keep up with! This workshop serves up just what you need to know for your clients, and leaves the extra stuff behind. With all the information available out there, a professional could easily make learning about the latest evidence a week-long endeavor! "Babywearing for Birth Professionals" saves you time and head space. 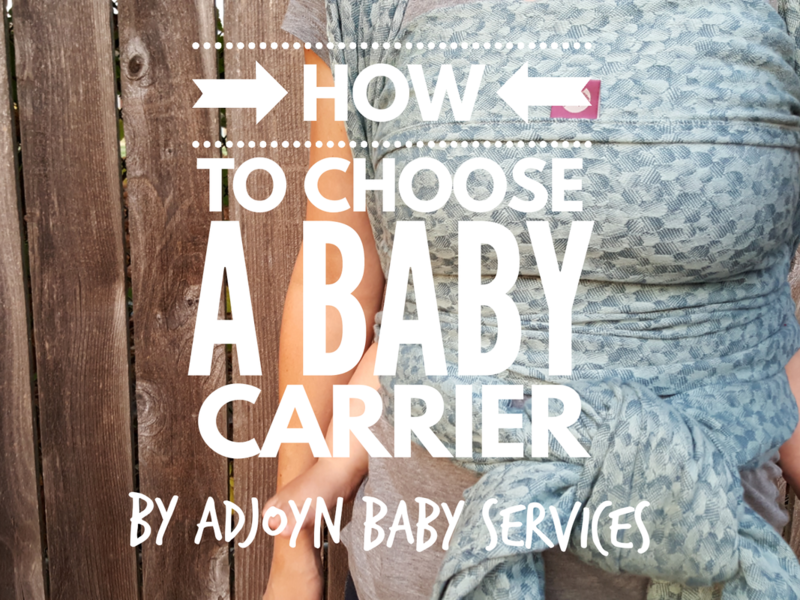 How to use the 5 main carrier types and their basic differences. How to "plant the seed" to encourage babywearing as a solution. Language to reduce caregiver's overwhelm. How to use and troubleshoot issues with the 5 main carrier types. How carriers support goals for Kangaroo Care and are used as a public health intervention. Breastfeeding in the carrier and "on the go" to promote breastfeeding success. Benefits and drawbacks of each carrier type. Safety and positioning guidelines that apply to all carrier types. All via evidence-based information from a certified babywearing consultant. Who are we learning from? Amy Rainbow is a Certified Babywearing Consultant (CBC) educated by the Center for Babywearing Studies (CBWS). She has been a babywearing educator since 2015, both professionally and as a volunteer for the non-profit Babywearing International of Portland as a community educator and chair of the Education Committee for the national board of directors. Amy has guest lectured about babywearing for Birthingway College's Postpartum Doula curriculum, as well as presented at the WEAR Babywearing Conference. She is Winner of Babywearing International's Perla Robertson Distinguished Babywearing Educator of the Year award, 2017. Also nominated for WEAR Conference's Babywearing Educator of the Year, 2017. 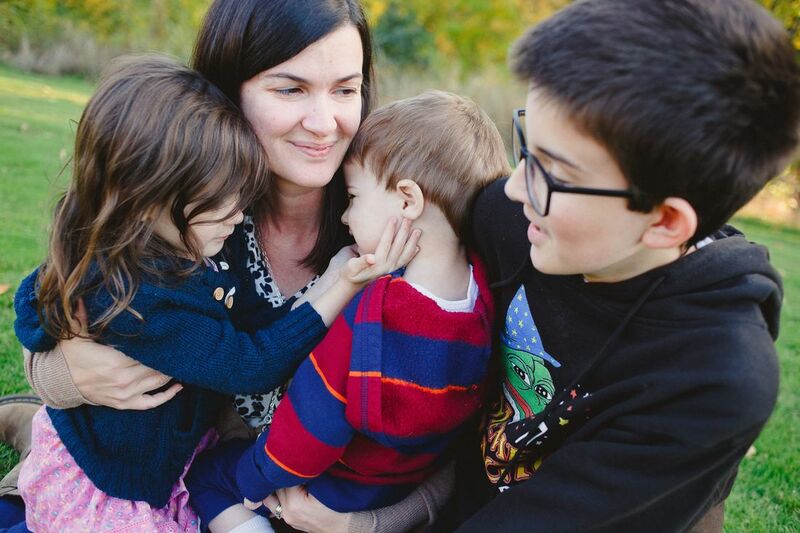 Amy works as a childbirth educator (LCCE) for a local hospital and in private sessions. She has three children and has been practicing babywearing since 2003. What if I don't have any carriers? That's fine! All the carriers and dolls that we'll need are provided. Even lunch is taken care of for you. All you need to bring is yourself! What if I've never worn a baby before? We'll start with the absolute basics and build our skills together! What if I'm really good at babywearing already? You'll learn to apply your skills for breastfeeding support, Kangaroo Care, and attachment success. You'll also learn to "plant the seed" with your clients to encourage carrier use and skill-building. What do we get out of the class besides baby carrier knowledge? Access to Amy for questions and troubleshooting at any time. All carriers, weighted dolls, and other supplies provided during class. A printed Certificate of Completion at the end of class. Why is babywearing an important skill for Birth Professionals? 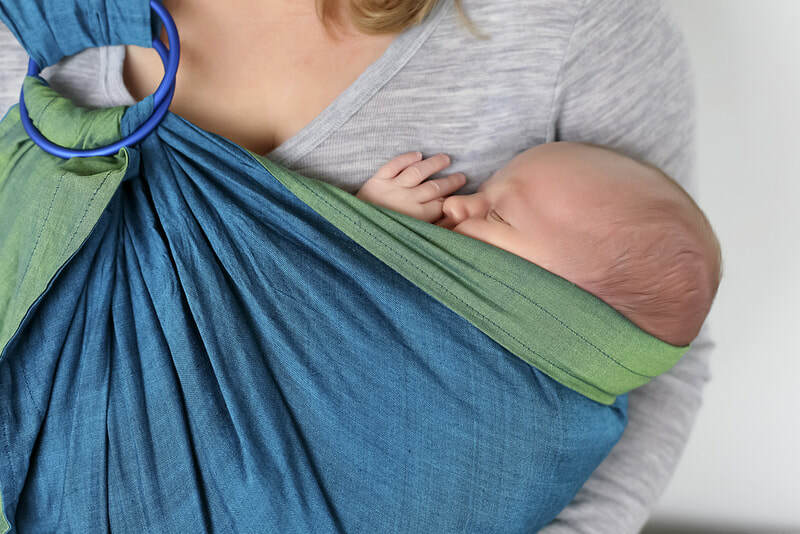 Babywearing is proven to reduce crying, improve symptoms of colic and reflux, encourage attachment and bonding, help caregivers keep up with life's demands and so much more. 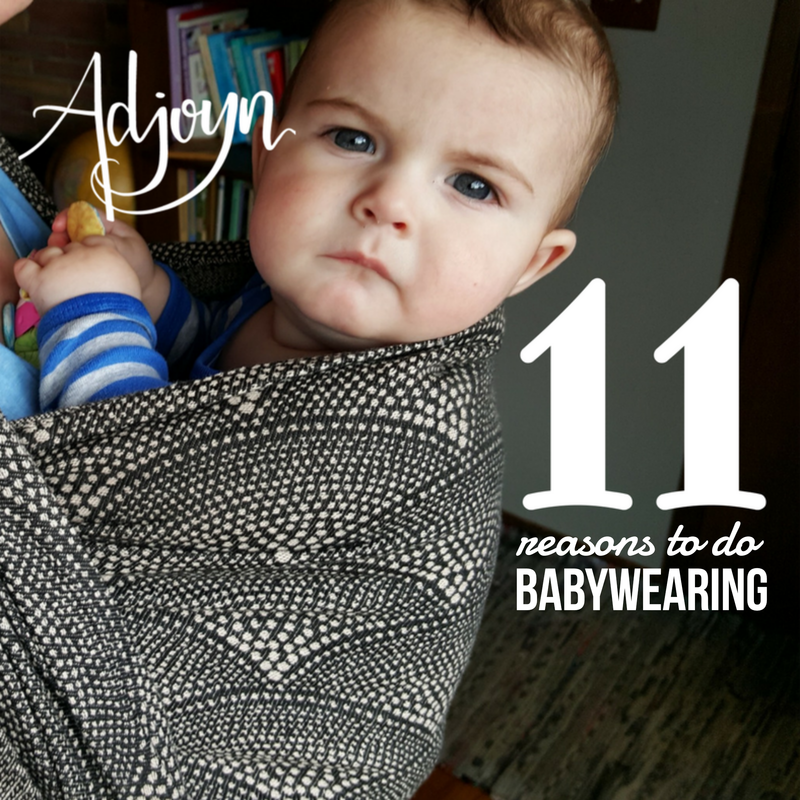 Read our 11 Reasons for Babywearing on our blog! Our first offering of "Babywearing for Birth Professionals" is coming up Friday, January 26th and is SOLD OUT! If you'd like to be notified of our next offering, email amy@adjoyn.com. So many NEW incentives for our services that just don't stop at the value of the service itself. A FREE universal car seat accessory: a Tula blanket! Up to a $25 retail value! Access to our referral program, making you eligible to get $10 cash back for EVERY new client you refer. ‎As always, no need to leave your home or wait: next-day appointments are available (most hospitals have a wait time of 3 weeks and you cpuld spend all morning waiting at a free clinic!). The same friendly and prompt expert service by our certified Child Passenger Safety Technician (CPST), Amy Rainbow! You may also be able to use your Health Savings Account funds for this preventative public health service - ask your plan coordinator (our merchant code is 8099). The referral program benefit applies to ALL clients of Adjoyn, even if you received your service for free! A new babywearing MINI session: short at-home sessions join our existing offerings of online mini sessions and full 90-minute at-home consultations. A package deal: reserve a car seat safety check with a 90-minute babywearing consultation and get $45 off with our package. Or, add a 30-minute babywearing fit check to a car seat appointment for only $25 (save $20 off scheduling separately). 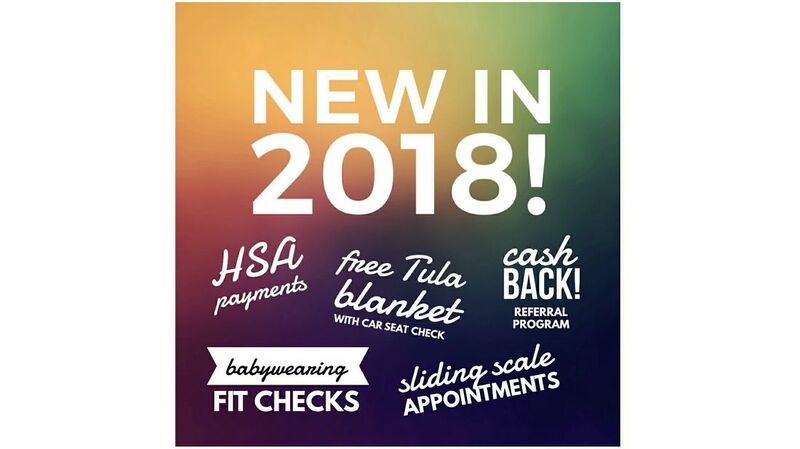 Sliding scale fee: a set number of appointments for car seat safety and babywearing will be booked for a reduced rate each month. Email amy@adjoyn.com with interest. New donation program: donate all or part of a car seat appointment to a low-income family. Classes and car seat clinic dates will also be coming soon! And don't forget about our amazing and engaging group for new parents: Beers and Babies will be exploring more breweries and visiting a summer beer fest! Finally, thank you so much to Ahava Creative Co. for refreshing our logo for 2018! Doesn't it look amazing?! If you're curious about the before-and-after, you can check out a comparison in a recent Facebook post. 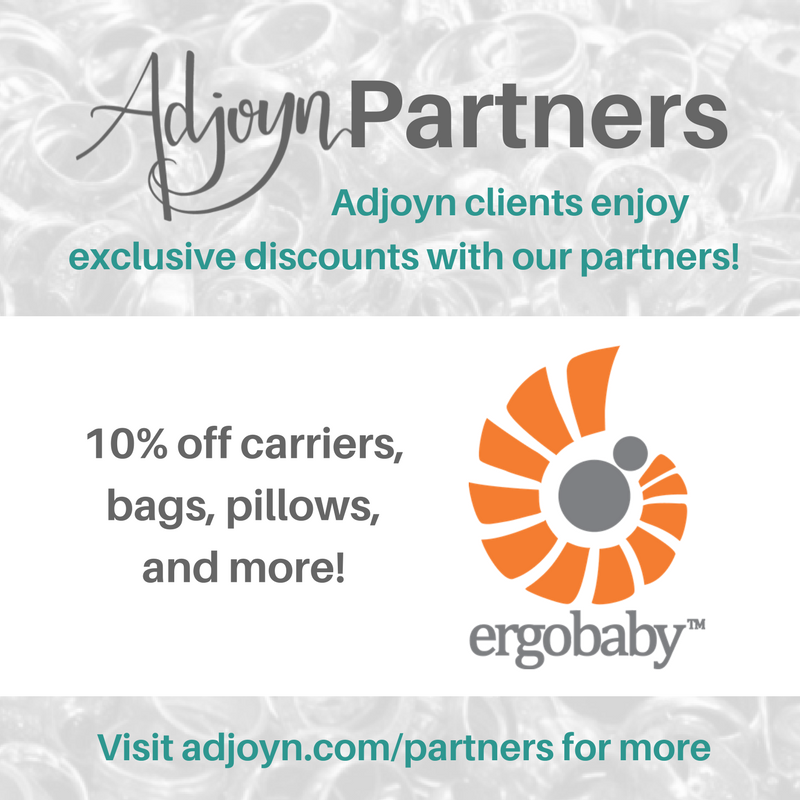 For more information on our babywearing, car seat safety, and childbirth education offerings at Adjoyn, click the Services page above or contact amy@adjoyn.com. Thank you so much to Dr. Angela Potter for featuring me as part of her Motherhood Insight series! Dr. Potter is an incredible asset to the postpartum community of Portland. She brings experience in nutrition, midwifery and women's health medicine, as well as a strong community presence and an intuitive, encouraging personality. You can read my full interview about my postpartum experiences here: www.drangelapotter.com/blog/amy-rainbow. Thank you to Becca Jean Photography for creating these photos! Lucy hit a big milestone at her seat check - time to switch from rear facing to forward facing! We know she's ready because even though she's just under 40 pounds, her height has reached the rear-facing limit. Because of her weight, though, we had to check a few more boxes on her forward-facing install. ​Here are the 7 things we adjusted, or the rainbow "Roy G Biv" of her big switch! You can also find this info in a post on a Facebook. 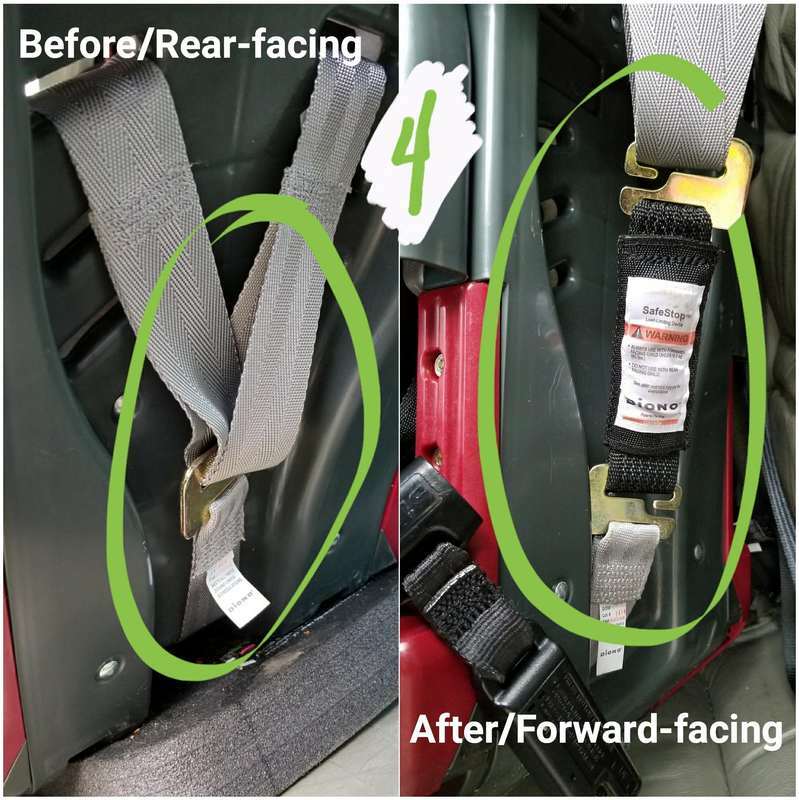 # 1/red: When we switched this seat to forward facing, we needed to move the lower anchors of the LATCH system out of the rear-facing belt path. # 2/orange: (continued from # 1) The lower anchors are now in the forward-facing belt path. Lucy will only use the lower anchors until she hits 40 pounds. At that point, we'll remove the lower anchors and store them in slots on the seat back, then use the lap-and-shoulder belt to install the seat through the same forward-facing belt path. 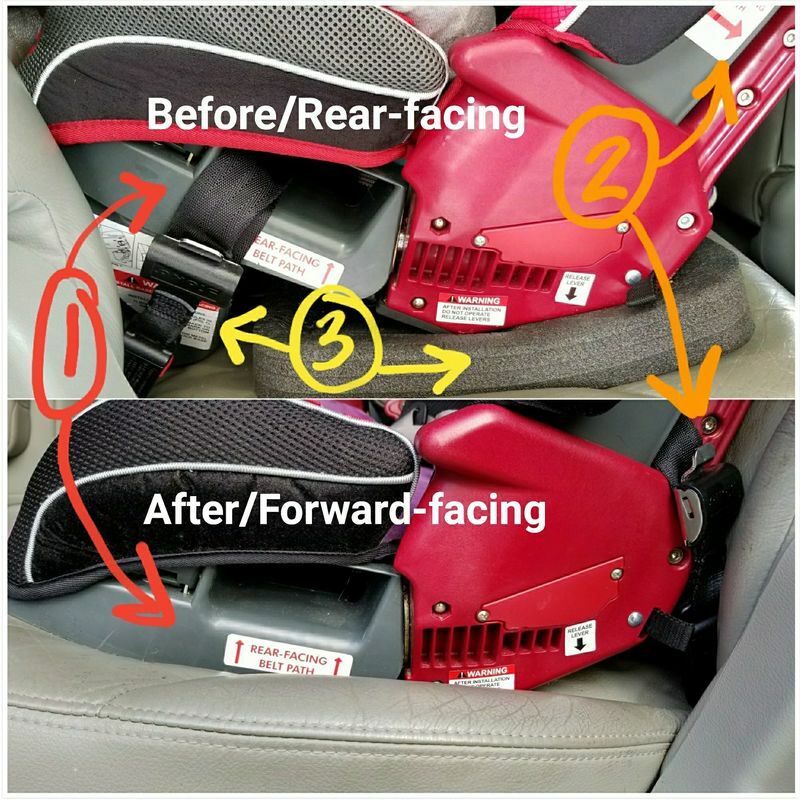 It's important that the seat beat locks the car seat in place so that it moves less than one inch at the belt path. # 3/yellow: For this seat (Diono), the rear-facing angle is adjusted using the detachable rear-facing plastic foot and the foam block angle adjuster. The foam block is inserted once babies can sit at a less reclined angle. When we move to forward-facing, BOTH these angle-adjusting items can be removed. On newer Dionos, you'll find an "adjustable bottom" which must be up completely (so it is flush with the seat bottom) for forward facing (and for rear-facing children under 25 pounds as well). 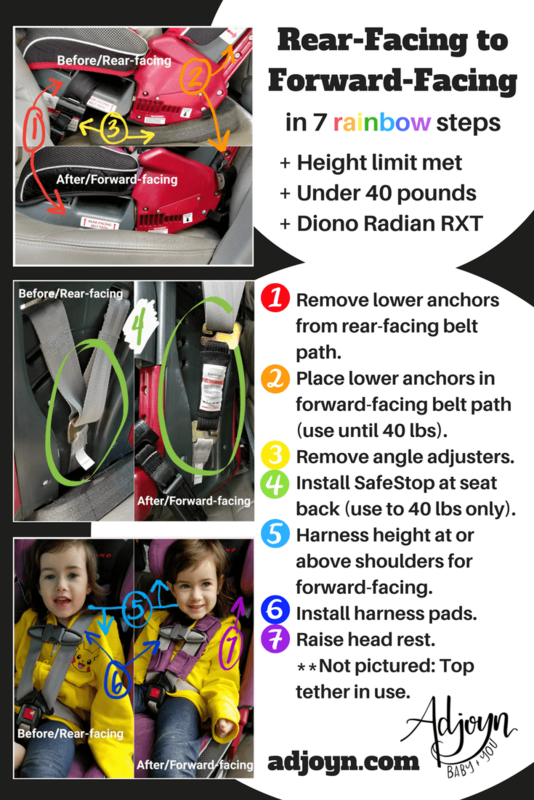 # 4/green: Because Lucy weighs less than 40 pounds, we need to install Diono's SafeStop on the back of the harness. When Lucy reaches 40 pounds, we'll remove this accessory. # 5/blue: When rear-facing, the harness should sit at or below the top of the shoulders. Now that Lucy is forward-facing, her harness can sit at or above her shoulders. # 6/indigo: Diono's harness pad is required for all forward-facing harnessed passengers, regardless of weight. It is optional for rear-facing and is not to be used as shoulder padding. 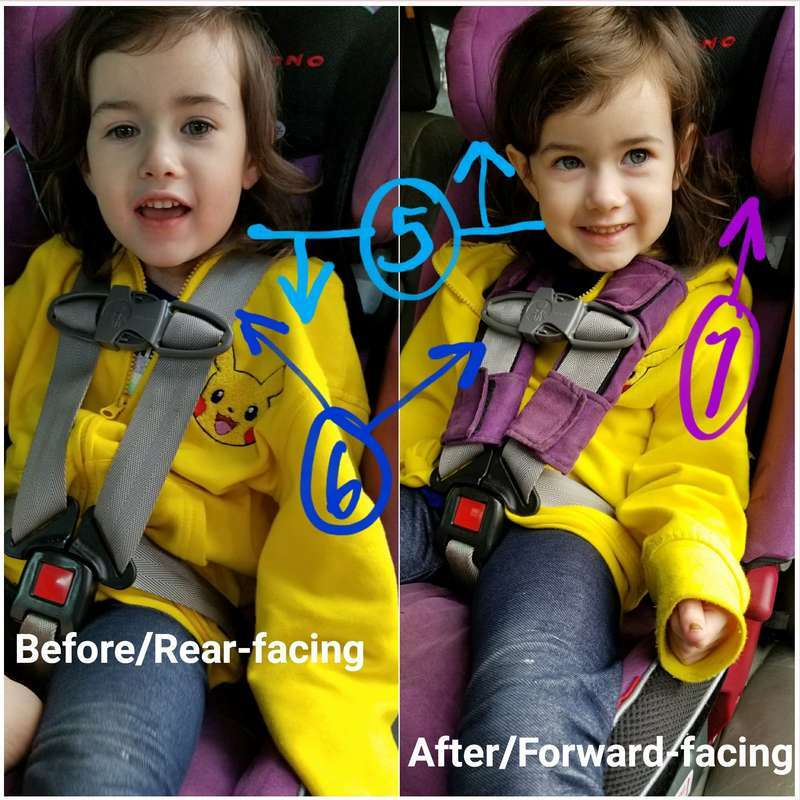 # 7/violet: This one has nothing to do with rear- or forward-facing, we just needed to move Lucy's headrest up to accommodate her growth in height! ** Not pictured: the top tether at the back of the seat is also in use now, secured in the tether anchor for this specific seat in the vehicle. Lucy loves her new set-up in her familiar seat. Not long now and we'll switch # 2 to a seatbelt install when we remove the SafeStop harness (# 4) at 40 pounds. A fun mini milestone to look forward to! ​Our seat checks can be scheduled just 24 hours in advance, with appointments available from 6am to 10pm. 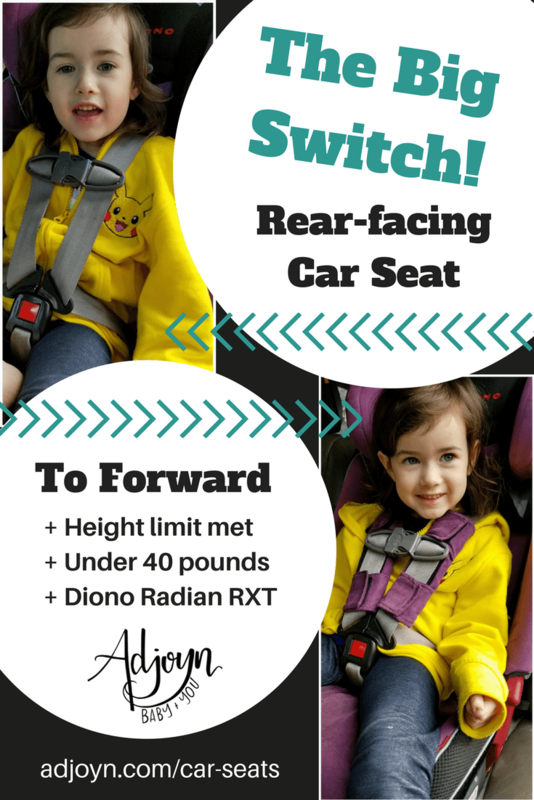 Find out more at adjoyn.com/car-seats! 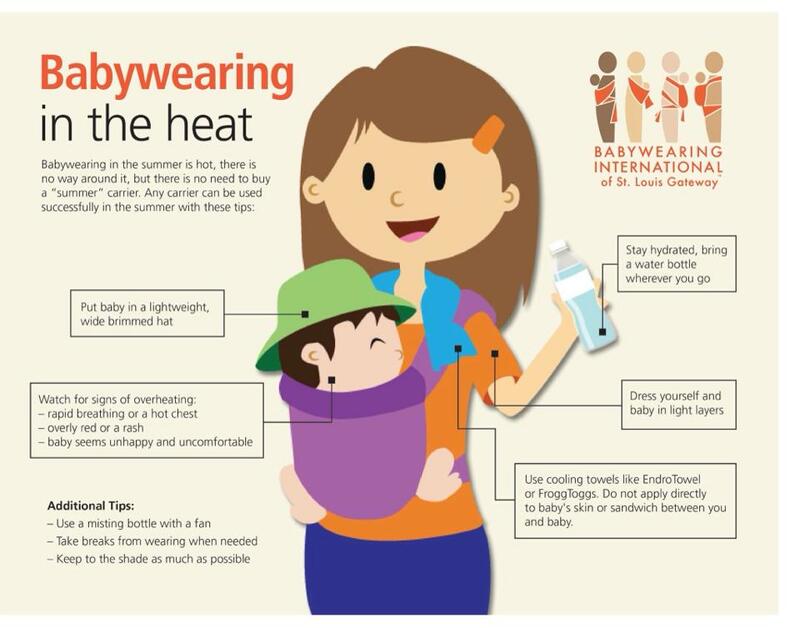 Quite simply, a baby carrier is one of the most practical pieces of gear you can have! It allows for multitasking, easy travel, and babies who are carried cry up to 43% less!! 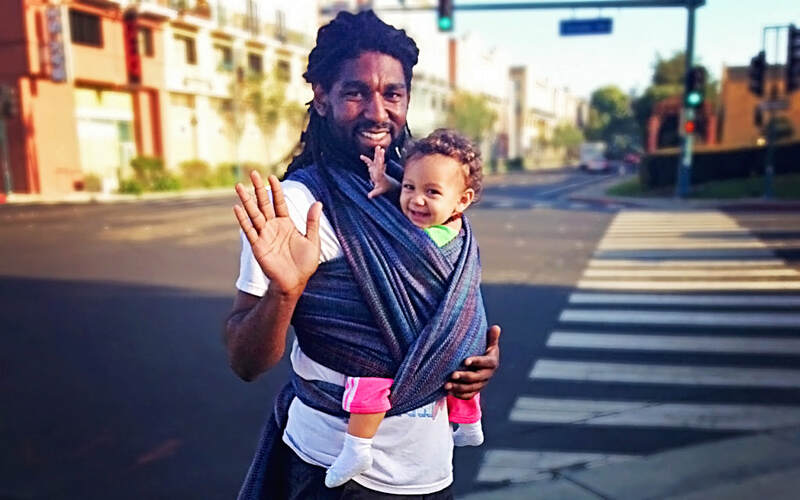 (1) Here are ten reasons why using a baby sling, or "babywearing," is right for you. ​11. Babies don't know you want your dinner warm. They don't even know you want dinner! They just want to be held. But it's really hard to hold a floppy newborn and cut - let alone eat - your own food. Enter the baby carrier. 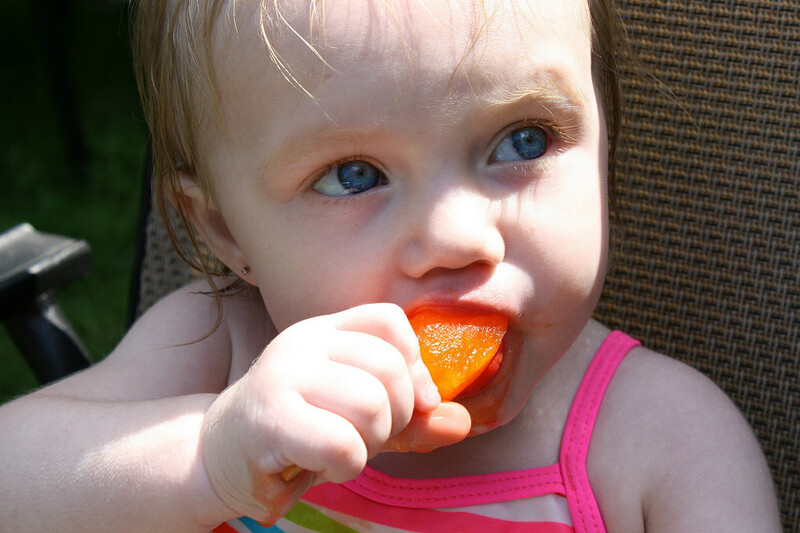 Eat and even prepare foods without having to use any hands to hold that snuggle-lovin' baby. 10. Your movements make baby so happy. And well digested. 9. Babywearing helps with breastfeeding. Breastfeeding is largely supply and demand. The more often the breasts think they have to make milk, the more milk they'll make. By having baby up close to the breast, hormones are being released in the mother's body that can encourage milk supply, even if baby isn't nursing. (3) Babies also love being close to "the refrigerator" to smell all your wonderful smells - even when you haven't showered! 8. Strollers can't go everywhere. Crowded festivals, ancient ruins, the beach, urban stairways - strollers sure are convenient but not everywhere. When you need to zoom in and out of tight spaces, babywearing is there to give you speed and LIFT baby out of the crowd. ​7. Strangers don't recognize baby's "personal space"
But they recognize yours! Keep those well-meaning germ carriers - uh I mean people - away from baby's precious face by keeping baby close to your body. So much easier then "accidentally" pushing someone with a stroller. 6. Babywearers have their ish together. 5. Postpartum mood disorders can feel a little less overwhelming with babywearing. ​4. Babywearers get things done. Got emails to answer? Papers to read? Netflix queues to demolish? Babies still want to be held through all that, but you can still be productive! Put up that baby and get to work. Just try not to over-do the stressful work if you're still newly postpartum, right? 3. Worn babies are smarter, sleep better, and gain more weight. 2. Your body is baby's happy place. ​If you're ready to do some babywearing but don't know where to start, your local Certified Babywearing Consultant is here for you! At Adjoyn we offer 90-minute in-home appointments and small group workshops to help you find your plan. 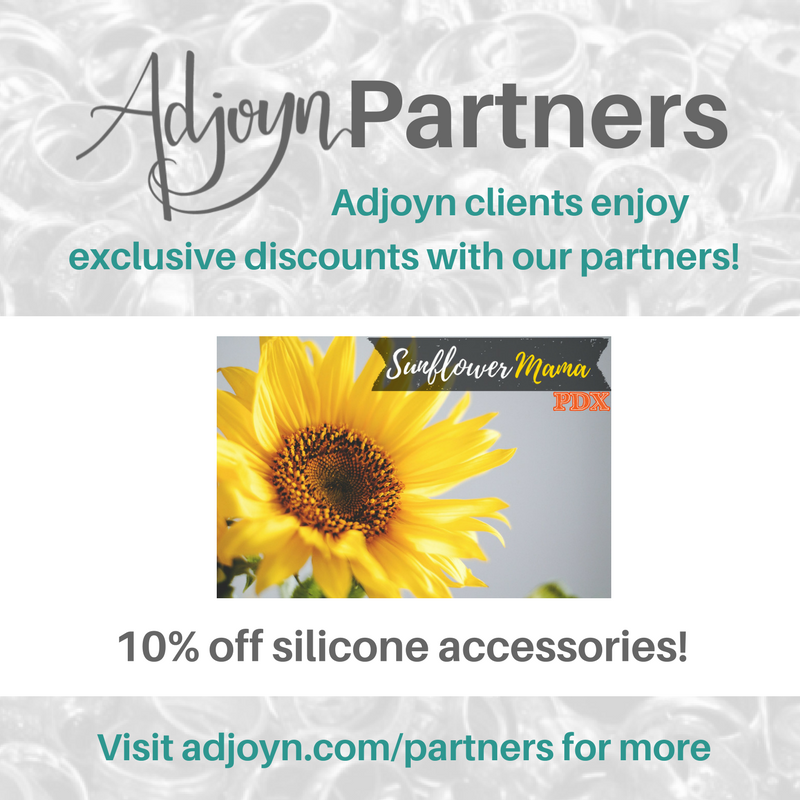 Visit adjoyn.com/services to find the latest offerings! Amy Rainbow is a babywearing educator and enthusiast. She offers babywearing education for Adjoyn as a Certified Educator, as well as volunteering for Babywearing International of Portland. Find more of her writings at amywrapsbabies.com. Rejoice in reliable care for your precious babies with Planet Nanny! 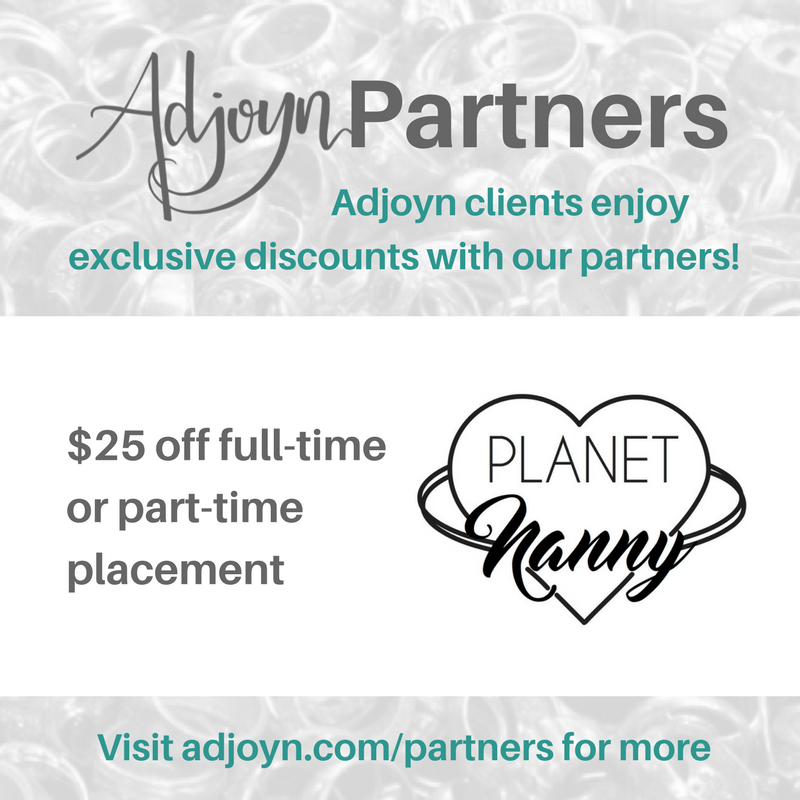 Adjoyn clients get exclusive access to $25 off your full-time or part-time placement to this Portland-area childcare service. Find Planet Nanny on Facebook, Instagram, and online at theplanetnanny.com.